English and Spanish are also spoken. 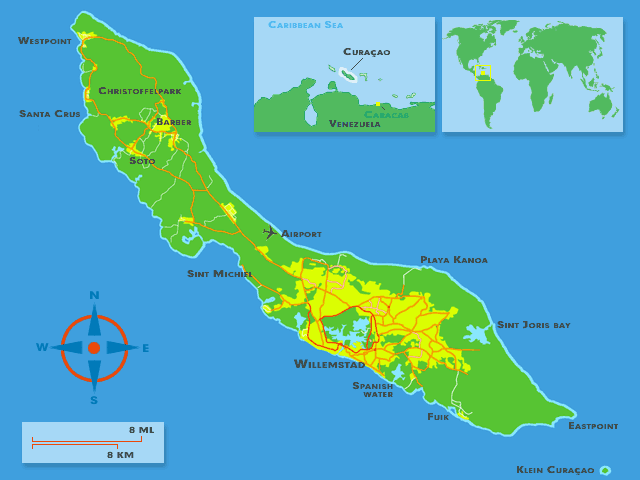 Curaçao is an island in the southern Caribbean Sea, off the Venezuelan coast. 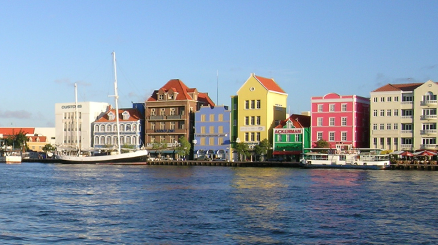 Prior to October 10, 2010 when the Netherlands Antilles was dissolved, Curaçao was administered as the Island Territory of Curaçao (in Dutch: Eilandgebied Curaçao). Derived from Portuguese word for heart (coração), referring to the island as a centre in trade. The name of the indigenous people of Curaçao had used to label themselves. 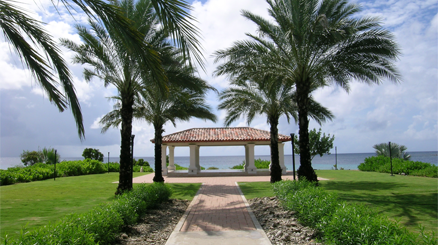 Curacao has a semiarid climate with a dry season from January to September and a wet season from October to December. The temperatures are relatively constant with small differences throughout the year. The trade winds bring cooling during the day and the same trade winds bring warming during the night. The coolest month is January with an average temperature of 26.5 °C (80 °F) and the warmest month is September with average temperature of 28.9 °C (84 °F). The year’s average maximum temperature is 31.2 °C (88 °F). The year’s average minimum temperature is 25.3 °C (78 °F). Downtown (Punda and Otrabanda). 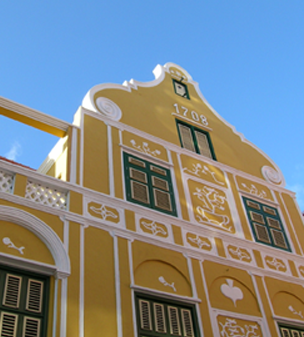 The Dutch colonial architecture is reflected in the downtown area, some of the buildings being UNESCO world heritage site. Baya Beach , Blue Bay,Daaibooi, Grote Knip, Kleine Knip, Playa Forti, Playa Gipy, Playa Jeremi, Playa Kalki, Playa kanoa, Playa Lagun , Playa Porto Marie, Playa Santa Cruz, Santa Barbara Beach, Seaquarium Beach, Westpunt. Understanding the need of patient’s family when coming from abroad (medical tourism) Sahoury Pain Clinic has a detailed list with all the important locations near the Institute. Centrally located, the clinic possesses the privilege of being minutes away even walking distance from several shopping centers, restaurants, hotels, supermarkets, airlines and banks. An upcoming unexpected trip (medical tourism) to the beautiful tropical island of Curaçao can be the cause of much travel stress. Having an estimate of your expenses prior to your departure will eliminate most unplanned monetary frustrations and help you go through your trip to the fullest. For a quick overview please review the table below. If you rather by groceries and cook your own food, we’ve estimated that the average expenditure per week for two people will be more or less USD 120.00. The basic food basket will include: noodles, rice, potatoes, bread, grains, corn flour, wheat flour, cereals, milk, butter, oil, baby food, tea, chicken, eggs, Dutch cheese, lettuce, tomatoes, bell peppers, broccoli, spinach, carrots, cabbage, avocado, pumpkin, onions, grapes, water melon, orange, banana, mango, apple and general basic medicine (e.g. aspirin). Curaçao is extremely popular for its duty-free shopping, and many travelers take advantage of the many shops and vendors that line the streets in places like Punda and Otrobanda. Popular purchases among tourists are: jewelry, local artwork, Curaçao liqueur, Dutch Delftware, and wooden shoes. Produce markets are also popular with visitors to the island. Dutch cheeses are one of the best edible souvenirs you can get on the island. There is a “sales taxes” applied to all purchases of 6 percent (O.B). All tourists over the age of 2 must pay a departure tax of $20(USD) for all international flights. If you're leaving Curaçao for another island, the fee is $5.75(USD). Airlines sometimes include the price of the departure tax in the overall cost of the plane ticket, but you should check with your airline to be sure. Check medical insurance policy for coverage out of country. Decide whether to purchase travel insurance. Insure that passport and/or visa is current. Comfortable shoes (walking and/or beach). Comfortable Cloths (swimsuit, shorts, t-shirts and jeans). Accessories (extra: sunglasses, prescription glasses, contact lenses). Creams (lip balm, sunscreen, insect repellent). Electricity adapters & travel adapters (Curacao’s electricity voltage is 127/120 VAC at 50 cycles). Adjust clock to local time. Be sure to drink enough water to avoid dehydration. Recommended times to sunbathe are from 7:00 am to 9:00 am and between 4:00 pm to 6:00 pm. When the sun is less harsh. Prescription drugs, particularly if they contain narcotics, should be clearly marked. Unlike in the Netherlands possession of illegal drugs is a serious offense, punishable by law.